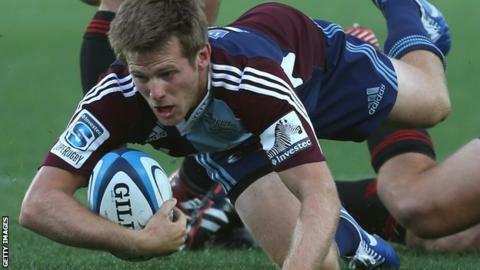 London Irish have signed fly-half Chris Noakes from New Zealand Super Rugby's Blues on a two-year contract. Auckland-born Noakes, 28, who has also played for Otago and Bay of Plenty, joined Blues in 2013 from Highlanders. Noakes returned from a serious neck injury in February to play in Blues' Super Rugby opener. "He's a prolific goal kicker with a 75% average in the Super XV and he knows how to get a backline moving," said Exiles director of rugby Brian Smith. "Chris is a very accomplished fly-half. "He is also eligible to play for England and we feel he is very well suited to the European game." Noakes is expected to provide competition for Shane Geraghty and Ian Humphreys, although the latter has been linked with a move away from the club.